Brayer are specialist designers of luxury kitchens in Oxshott and the surrounding Surrey and Southwest London regions. Our exclusive kitchens are made custom to our clients requirements – designed and crafted all in one place at our Surbiton workshop. From marble, granite or butcher block worktops, islands and dining areas, pantries and even the odd secret doorway, no two Brayer kitchens are the same. Opposite are a selection of kitchens from our portfolio that we have designed and installed in all different kinds of homes and spaces in Surrey and South West London. For more details about each of these designs, view our online kitchen portfolio here. 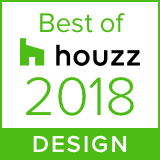 As well as earning recognition as Best in Design from Houzz in 2015 and 2016, we have also been awarded Best in Service. Though beautiful bespoke design is at the heart of what we do, we believe that our attention to detail, our quality service and rapport with our clients is what sets us apart from other kitchen design companies. Click here to read our 5 star reviews on Houzz. Our design office, showroom and workshop is just a ten minute drive from Oxshott by car. If you would like to arrange an appointment to see more kitchens by Brayer and to discuss your space, please get in touch using the contact form below or call 0208 397 1111. Our address is: Unit 7 Chancerygate Business Centre, 214 Red Lion Road, Surbiton, Surrey, KT6 7RA.